Things I liked: Beautiful gun, feels like the real thing. Umarex high end guns are all high quality and built to last. A lot of fun to shoot and very accurate. Things I would have changed: Not a thing. The dual safety takes a bit of getting used to but its a characteristic of the original 1911 and makes the gun authentic. A must for collectors of famous hand guns! What others should know: I love Umarex high end guns and am working on owning them all. Pyramid has been an excellent company to deal with. Had some issues with web site ordering (user error).. Ruth helped me place order and was great to deal with. I ordered two guns with one order and only one shipped. I was nervous about Pyramids response but called Ruth again and it was shipped no questions asked. Great customer service! Things I would have changed: Include sight adjustment for elevation as the pellets strike about an inch high at 20 yards. What others should know: The grip safety transmitted a very gritty feeling when depressing it. My pistol failed to fire any more after a total of approximately 80 shots. The pistol was sent to Umarex for repair and when it was returned it still would not fire a pellet. I am preparing to return it for repair again and will reserve judgment until I get it back. Howver, at this time I am not at all satisfied either with the quality of the pistol or the quality of Umarex repairs. Things I liked: Feel, look are good. Pellet magazine is clever, nice it includes 2. Things I would have changed: Trigger is sooo long and heavy it is not realistic and effects accuracy. Things I liked: A German made 1911 that shoots pellets. If you like this style of gun the quality speaks for itself. Single action trigger pull is really good. Things I would have changed: This gun is not blued it's painted. White dot sights gets would have been nice. What others should know: This, like the Walther CP88 I bought, are not blued, they are painted. Disappointing but it's still a great build and shoots well. Things I liked: Gun looks authentic, looks like quality construction. Things I would have changed: This gun has a heavy trigger pull compared to my Walther CP88 Comp. This might change over time with use. Wood grips should be made available. What others should know: The first gun I ordered was returned the Pyramid. The gun would function in the double action mode but not in the single action mode. Pellet would not clear the loading wheel. Return Service was prompt. The second gun arrived and functioned properly. Would use Pyramid again! WOW --- same situation here in Montana August '17. I sent mine to a good (airgun) gunsmith whom I dealt with previously and satisfactorily, he confirmed the hand isn't advancing the cylinder far enough to align properly, but there doesn't seem to be a fix that is dependable. He is returning it to me, functioning fine in double action but not single (a 1911 should at least work single action!!). If I wrote my own review it would be a one-star for that reason. A $200+ air pistol should work better than this. I should have returned it instead of sending it out to a smith. Things I liked: The feel of this gun is very realistic. It shoots well also. When shooting this gun, it feels and acts like the .45 ACP Colt 1911, both in double and singles action modes. I give the "Accuracy" rating a 5 star because it has about the same accuracy as the original. The .45 ACP Colt 1911 was designed for "Close combat with high impact", (stopping power is it's strength not accuracy). So if you want to get better with your "real" .45 ACP Colt 1911, this is the perfect tool to use. At 15 feet I can hit the Center of the Ten Ring every time. At 50 feet the "Sight picture is different, (the front sight is "Higher" than the Rear Sight. It's that simple. The grouping is tight at close range, scattered at 50 feet, but still inside a half dollar. What others should know: The .45 ACP Colt 1911 has no adjustment on the rear sight. To learn to shoot this pellet gun or the original 1911, properly, then you need to interpolate the correct Sight Picture to be accurate at different distances. If you are looking to hit the center of the "Ten ring" then buy a gun that is designed for Target practice, there are plenty of single shot target pistols to choose from. If you want "Accuracy" and 'Realism" then choose an 8" barrelled, Single action, Revolver. Also, for the Colt 1911 CO2 pistol, buy extra magazines and Ammo, because this gun is very fun to shoot. So Far I have had no jams, I am using H&N Sport 8.18 g pellets, 3000 rounds so far. Things I liked: I had the opportunity to get out and test my new Colt 1911A1 pellet yesterday and couldn't get over it's accuracy right out of the box. It's a shame a pistol this accurate does not have an adjustable rear target sight option in place of the rear combat one. 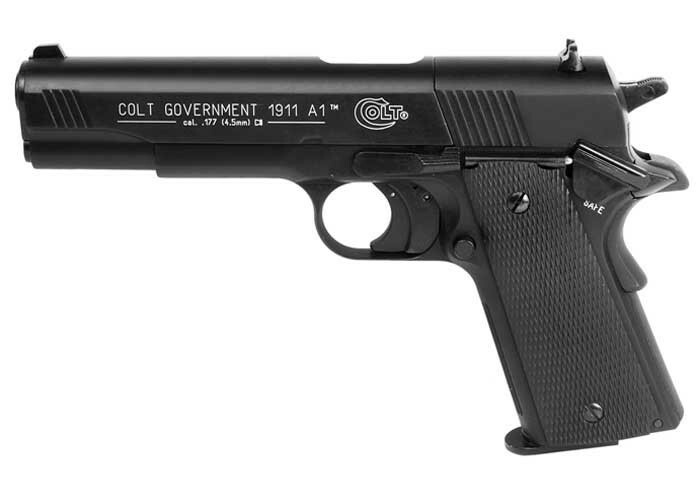 The Colt 1911 Combat Classic has one and is a BB pistol and over a $100 cheaper and not as accurate. Disappointed with the reasoning behind this. Things I would have changed: Needs an adjustable rear Target sight as an option. What others should know: Great single action trigger pull. Things I liked: Very accurate replica! Side by side with my Colt Custom Combat 1911 and looks the same! Like the ease of loading the Co2 in the grip! Rotary mags work well also but takes s little time to load them up! Get a few extra! Good accuracy at 20 paces in my basement. Shooting 2 inch groups or better with a few 1 inch groups now and then. Have 494 shots thru it with no problems. Very well made with excellent fit and finish! Things I would have changed: Would like a elevation adjustable sight. Shoots an inch high at 20 paces but at this distance the pellet may be at the high point in its ballistic curve. May work out good at 25 paces or more. Wouldn't change much else! Don't know that parts are easily available! Have checked Umarex website and have not found anything! This pistol is more expensive than most other replicas but the quality and shootability it has is worth it! What others should know: If you enjoy shooting airguns you'll like this one! Things I liked: The windage adjustment of the rear sight allowed me to get spot on on that sight plane. * The single action trigger pull could not be better; very light and smooth. Accuracy is good already using the Benjamin 7.9 gr ; lead HP, and I have not attempted to find out what pellets may group even tighter. I am getting 1" groups at 6 yards free standing and rested groups at 10 yards have a maximum spread of 1.268" with the vast majority of shots (13 of 16) into .889". These groups were made using the single action method. Using double action from a rested position became almost as good if the trigger is staged and the sights carefully aligned. Things I would have changed: The "Billboard" of white lettering on the right side of the pistol. This really detracts from what would have been a nicely attractive pistol. There is no need to print out a paragraph of boldly white lettering on the slide! Also, my pistol shot nearly 2-3/4" above the aim (top of front sight level with top of rear sight with top of front sight being the aim point) at 10 yards. This could have been corrected with a fully adjustable rear sight, which should have been standard at this price point on a pellet pistol. I found that if I "sun-setted" the top of the front sight in the rear notch so that only about 40% the total front sight height was visible above the bottom of the notch, I was getting the desired impact point on the target. Of course, one would not have to do this with a properly regulated sight system. What others should know: Initial operation of the double-action trigger was somewhat rough and much heavier than after the first 100 shots. It became steadily smoother and a little lighter with use. I got the impression the roughness was the result of the friction between the rotating clip and the surfaces it contacted. I had tried the trigger first before I charged and loaded the gun and found it pleasantly light and smooth. After loading the gun and firing it the first time, the trigger was rough and heavy for some time. The grip safety was also initially gritty but also smoothed out with use until it became smooth. Velocity was chronographed with the 7.9 gr. pellets and found to be a fairly consistent 415 fps. when slow-fired to prevent cooling. I easily got 80 shots before any drop-off began. I solved my elevation problem by using epoxy to attach a .085" thick piece of brass that I machined to the proper dimension for a taller front sight. I can now aim normally and have spot on impact of the pellet.
" I solved my elevation problem by using epoxy to attach a .085" thick piece of brass that I machined to the proper dimension for a taller front sight." Papa, that's brilliant. And a fine craftsman you must be! Got a website with some photos of your mods?? Things I liked: I bought this gun from Pyramyd several years ago and wasn't able to actually use it regularly until recently. The gun feels great in the hand with great heft and nice balance. I looks great and is very similar to the actual 1911 in many ways so far as said feel and looks go. It's very accurate (I shoot it indoors at 10 to 15 feet most of the time). Things I would have changed: Not much. The way this is designed you can't have a blow-back function and that's about all you do to make it more realistic. What others should know: I bought the gun when my wife was very ill. I was her care giver and for that reason I didn't get a chance to use the gun until after the warranty had run out. When I did I found that the gun was faulty. The warranty having expired I had to pay for a repair only when I got the gun back it had the same problem. Upon my sending it back to Umarex the second time for repair they simply replaced the gun. That gun is the one I'm reviewing and it has been a pleasure to shoot. Things I liked: The appearance and weight are the same as a real 1911. accuracy is great, 1.5 inch group at 7 yards with no problem. Really like how the co2 cylinder loads. Things I would have changed: Adjustable rear sight. What others should know: the price is a little high, but the gun is all metal. It is a great training gun. Also cheaper to shoot than a 45 1911. Things I liked: Weight, look, and feel of this airgun is outstanding. It's impressive in your hand and feels like a real firearm. The gips are rubber rather than plastic. The DA trigger is ok - much better than other Umarex mini revolvers that I have tried. I like the cartridge loading system. It takes the guesswork out of tightening the cartridge screw. Things I would have changed: I found the SA trigger to be clunky, long, and unpredictable. I tried two and both had the same issue. Although the trigger is very light (perfect pull weight for me), the second stage is mushy and did not break crisply. On both guns, but more so on the one I had to return, the trigger would bottom out in the trigger guard before the release. I prefer to squeeze the trigger slowly when target shooting, but my finger would contact the trigger guard before the release, which would alter the pressure required to fire the gun. Of course all accuracy was lost. I could only get reasonable groupings by pulling (almost yanking) the trigger quickly. This is probably proper technique, but just not the way I shoot best. Both guns shot high to very high. This would be ok for a $50 airgun, but this is the Umarex flagship - come on! I have more than a dozen air pistols and none of them shoot so far off point - even the $50 ones. Nothing else I would change. What others should know: I had to return the first one and Pyramydair was awesome. The grip safety was misalligned and would catch when fired left handed. The trigger was a mess on that one, and the gun fired about 8" high at 20 ft. I'm keeping the second one because it only fires about 4" high at 20 ft,and I think it will imrpove my technique. Once you figure out how high or low to aim, you can consistently hit a can at 30 yrds, so the gun fires true. Things I liked: At the right range this AP is very accurate, but because the rear sight is not adjustable for elevation, this may not be all that obvious. After a bit of experimentation, I discovered that the elevation was spot on at 7M, so that when I shot a 10M ISSF target at 7M, I got a group centered in the black with an aggregate score of 89% using a 6 o'clock hold. This was on my first cartridge before I really got comfortable with the gun, so I suspect that I can get even better. I'm 72 shots into my first cartridge and it is still shooting that accurate, but suspect that I am near the end of the useful range based on earlier reviews. The trigger is not as nice as my real 1911A1, but the overall feel and grip angle should help with in home 1911 practice. Things I would have changed: Incorporate fully adjustable rear sight either as an add on or as a target model. Trigger pull is a bit rough, and a bit on the long side. The double action trigger pull on this should match the regulation 1911A1 competition weight so you can better simulate timed (5 shots 20 seconds) and rapid fire (5 shots 10 seconds). What others should know: You really need to grip tight for the grip safety to work properly, which while odd for AP, is good practice for shooting a real 1911. While a real 1911 does not "require" this tight of a grip, I get better accuracy on my real 1911 when I grip it this tight. Things I liked: The workmanship, weight and obvious quality. To me, comparing this to my Tanfoglio Witness and KWC Blackwater 1911 really tells the difference in materials, etc. Accuracy is excellent. You're definitely rewarded for utilizing proper grip, breath control and trigger pull. The grips, to me at least, feel like rubber and they're excellent. I get a solid 80-88 shots before I stop so as not to cause a jam. Things I would have changed: The grip safety could work just a bit better in my opinion; not that it's bad or doesn't work mind you, just that it could operate smoother. Perhaps a white dot on the front sight would have been nice as well. I would have loved the wooden grips but I couldn't justify the difference in price. What others should know: This is a very well made, high quality product. It really does feel like a product that will last many years and well beyond its less expensive counterparts. I not only highly recommend this pistol, I also highly recommend getting extra magazines because you'll be shooting this a lot. Things I liked: Beautiful workmanship on this pistol, very accurate & rifled barrel, efficient on CO2, easy to operate, uses same cartridge as my other UAREX pistols. I wanted double or single action trigger, this has it but manual pull back for trigger. Things I would have changed: This is not a blow-back, the grip safety is not very smooth (can result in failure to fire if your grip not firm enough to engage), sights are basic - would prefer white dot to improve visibility. What others should know: I bought this as I wanted very accurate, realistic 1911 style pistol with rifled barrels. It is more expensive than alternative, but delivers on quality and accuracy. Things I liked: I purchased this pellet pistol (before, and did not get/purchase the ten shot for $10 service), it did not operate as advertised but, I notified Pyramyd Air within the 30 days after purchase period, and Pyramyd Air honored their stated return policy, and sent me another Colt 1911A. I did purchase the ten shots for $10 service for this pistol. Since purchase, I usually shoot 200 rounds, once a week (sometimes twice a week). I usually get approx. 100 rounds per CO2 cylinder, before the accuracy falls off. I have had no issues with the 'new' Colt 1911. I really like this pellet pistol and enjoy it each time I shoot it. Buy many magazines (8 rounds per magazine). Thank you Pyramyd Air. Things I liked: Very realistic feel and weight, I have a Springfield Armory 1911 A-1 .45ACP and this is very similar. Best accuracy is achieved shooting single action. Things I would have changed: Shoots about 2 inches high at 30ft. While I appreciate the stock sights in keeping with the Gov't issue 1911, an adjustable rear sight would be useful. What others should know: I get about 90 shots, the last 10 drop pretty quickly. Things I liked: Accuracy, In Both shooting and in build. FPS is adequate, better than most. Quality fit & finish far surpasses any airgun manufacturer. Things I would have changed: Price of course. What others should know: Although the rubberized feeling plastic grips are better than plastic feeling of the CP88's plastic grips If I had it to do all over again I'd buy them both with the wood grips to begin with. They really make a great looking pistol a Beautiful Showpiece. Evan--Pyramyd Air does have wooden grips for this gun. Does Pyramid Air make wooden grips that fit this model? Things I liked: All metal extreme quality gun. The Walther style metal magazines fit many of my other guns. Realistic feel (heavy) and vy accurate out to 15 yards. Put in a friends hand they'll think its a powder gun.. Things I would have changed: Maybe rubberized grips. The plastic ones feel cheap and are the only glaring drawback to its esthetics. At close to $200 they should be rubber if not wood. What others should know: I bought the wood grips and have noticed a better feel and of course look. Really long pellets can be too long. Seems to accept alloys without to much fuss, some better than others. No Crosman alloy pellets work good. As always you get what you pay for. wooden grips seem to be no longer available from Pyramyd. It's a shame because they really look good and change the guns appearance substantially. I'm lucky I bought them when I did. Things I liked: Metal construction. Pretty good feel compared to the real thing. Accuracy is pretty good, given the shorter barrel. Things I would have changed: personally, I'd give it a 6" slide and contoured rubber grips to match my real thing, but that's just me. What others should know: Stock plenty of pellets and clips, because you're gonna go through them at an alarming rate.